The Freedom From Religion Foundation is spotlighting several constitutional violations occurring in schools all over a West Virginia school district. FFRF has received multiple reports that Wood County Schools has allowed teachers and outside adults to facilitate religious instruction during the school day in its elementary schools. For example, representatives of The Warehouse Church and schoolteachers have created bible clubs at Kanawha Elementary and Blennerhassett Elementary, recruiting students at lunch. 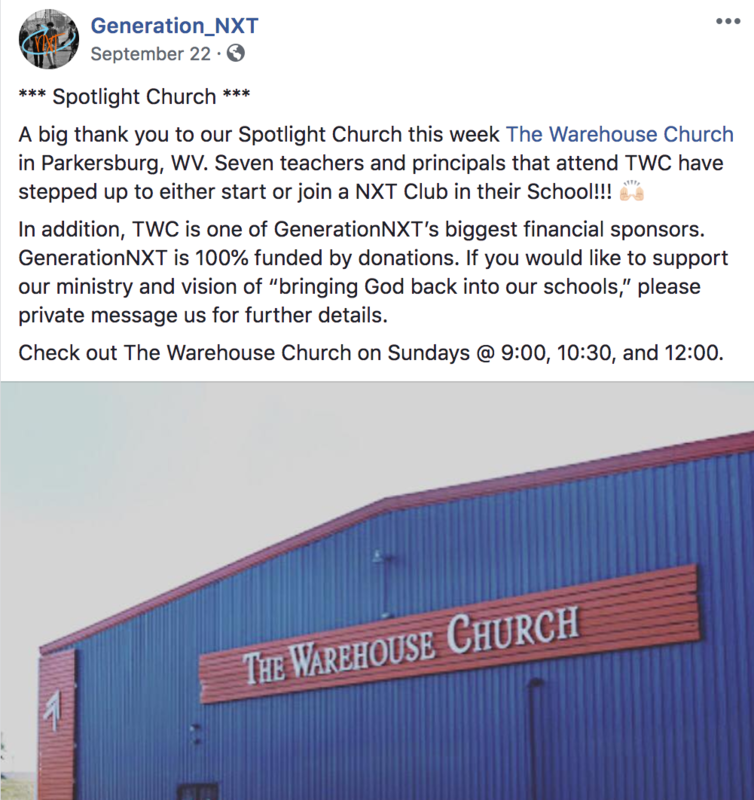 The bible club, “Generation NXT,” has openly admitted that teachers and principals “have stepped up to either start or join a NXT Club in their School!! !” 9-to-11-year-olds have reportedly been targeted as participants in the bible groups. It is unconstitutional for the district to offer religious leaders access to proselytize students during the school day on school property, FFRF reminds the school district. Seventy years ago, the Supreme Court ruled that a program that permitted religious instruction on school grounds violated the Establishment Clause of the First Amendment. The district’s behavior demonstrates an unlawful preference in this instance for evangelical Christianity over all other faiths. A school’s assistance in this practice constitutes “a utilization of the tax-established and tax-supported public school system to aid religious groups to spread their faith,” to quote the U.S. Supreme Court from the landmark 1948 McCollum case. Coincidentally, FFRF has sued the city of Parkersburg, where the Wood County Schools system is headquartered, due to the city council’s practice of reciting the Lord’s Prayer at each meeting. The students in question here are young, impressionable and vulnerable to social pressure, particularly pressure exerted from adults. And it makes no difference that students are not required to attend this religious program, since voluntariness does not excuse a constitutional violation. Church representatives may try to assert that these elementary clubs are “student-led.” Yet, families within the school system report that isn’t correct. FFRF is also unaware of any case where a court has found that elementary school students have permissibly led a religious club during the school day. Additionally, it appears that Generation NXT clubs even within Wood County Schools middle schools are unconstitutional. Any school religious groups must be bona fide student clubs that are both student-initiated and student-run. Outside adults cannot regularly attend these meetings and teachers cannot participate in religious activities with students, unlike what’s happening in these middle schools. FFRF strongly urges that Wood County Schools immediately discontinue all Generation NXT religious group gatherings within its elementary schools and disband all teacher-led clubs. The Freedom From Religion Foundation is a national nonprofit organization with 32,000 members across the country, including members in West Virginia. Its purposes are to protect the constitutional principle of separation between state and church, and to educate the public on matters relating to nontheism.